It's about getting everyone out in the waves! Become a genuine surfer girl! Fresh, healthy food is a big part of the surf experience. Technical Coaching by passionate surf instructors. Design the perfect Costa Rica surf experience for your group! Our all-inclusive surf camps bring elite surf coaching to Costa Rica’s famed Nicoya Peninsula, home to some of the most consistent surf breaks in the world. Peaks n’ Swells beachfront villas are nestled at the foot of the jungle, in walking distance to the lively town of Montezuma. Catch waves all day, refuel with organic meals back at camp, and experience the very best of Costa Rica. Developed by professional surf coaches, the Peaks n’ Swells program will make you a surfer for life! 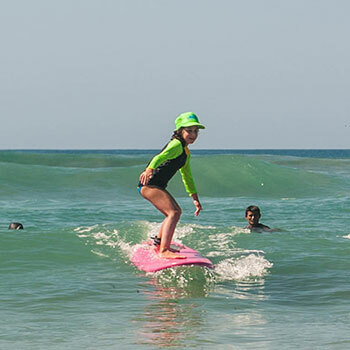 High-level surf coaching for the entire family, with special attention to safety and fun for the groms. Surf, connect and explore Costa Rica! Our beachfront villas and pro surf coaches are yours for the week! Grab your friends, grab a flight and we’ll customize the ultimate Costa Rica surf experience for your group. Relax, recharge, rejuvenate…and become a genuine surfer girl! Organic meals, yoga, massage, and daily surf sessions leave you looking and feeling great—both in the waves and out. Your day at Peaks n’ Swells is centered around your surf experience. We choose the optimal conditions for surfing each day, and then pair you with a coach who will custom tailor a progressive week of instruction just for you. Whether your goal is to catch your first wave, or to work on your bottomside turn, our coaches will get you there! Daily surf sessions at different breaks around the Nicoya are complemented by technique and theory lessons back at camp to help hone your paddling, duck diving and understanding of wave behavior. Our yoga instructors and massage therapists will help relax and rejuvenate sore muscles, while our chef prepares delicious and nourishing meals using fresh, organic ingredients to refuel and recharge you for the next session! 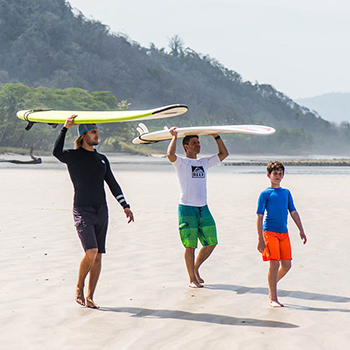 Our all-inclusive camps allow you to experience the best of Costa Rica as a surfer, not a tourist. Our unique beachfront location, just a short walk from Montezuma, offers easy access to waterfall hikes, horseback riding, local boutiques and restaurants, Cabo Blanco Nature Preserve, boat and snorkeling excursions, and a sea turtle sanctuary. Monkeys and tropical birds are regular visitors at camp, where you can cool off in the salt water pool or relax one of the many shaded hammocks around the property. Once you arrive at the airport, everything has been taken care of for your stay. Enjoy arriving at the best surf break for the conditions that day, fresh organic meals tailored to your preferences, yoga, massage, and super fun kid adventures if you are coming for a family session. When you arrive home from your time at PNS, you will not only have the new surf skills and knowledge to keep progressing at surfing but an amazing collection of photos and videos from your trip. All without thinking about one detail over the week! Pura Vida!